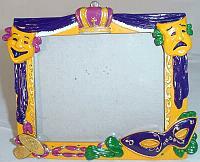 A 6" by 4" Mardi Gras picture frame. The frame is 8" wide and 6.5" tall including the frame border. It is decorated with two comedy & tragedy faces, a mardi gras mask, a crown and a strand of beads.